Even if its takes several weeks of training, it is a distance which is accessible to all, as long as you have the right trainers and a good playlist. It is a distance which also represents a significant sporting challenge and therefore gives you a real sense of satisfaction when you cross the finish line. Whether your goal is to run the distance for the first time and say 'I did it! ', or whether it is to impress your colleagues at work, or improve your time compared to your last race, the Run In Lyon Half-Marathon is the ideal distance. If it's your first Half-Marathon, you will be sure to enjoy a very pleasant route around a city which, from a cultural and historical perspective, is as good as any in the world. Within the first few kilometres, you will join the quays along the Saône. Is there anything nicer than running along a river bank? From the Vieux-Port (old town), you will run to the Paul Bocuse bridge. Then you will run back along the quays on the opposite side, back down into the Croix-Rousse quarter, famous for the Lyon silk industry and the well-known Canuts. Then there’s just another few kilometres to get to the Place Bellecour, the biggest pedestrian square in Europe. Whether it's your 3rd, 5th or even 22nd Half-Marathon, rest assured that this route is magnificent! You will also love the fantastic setting in which the race takes place. But maybe you will just be concentrating on your time. So you need to get started on preparing as best possible for October, 7th. We want this Run In Lyon to be a great memory in your running career! 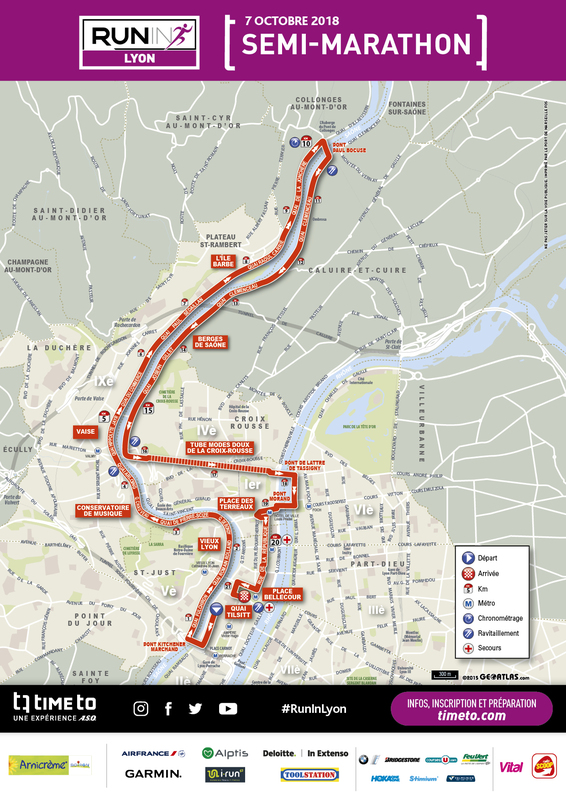 The route is quite simply superb and the Lyon crowds are always enthusiastic and will be ready to support you all the way to the finish line! In the meantime, we are preparing the asphalt!